Magento Ecommerce has a proven track record powering many of the largest ecommerce sites online today. The Enterprise Solution for Multi-Channel Commerce. To put it simply – Magento is one of the biggest things to happen in Ecommerce over the last few years. Magento is a solid Ecommerce platform built from scratch to promote the creation of simple, easy to use ecommerce experiences. Chances are you have already purchased an item from an ecommerce store powered by Magento. Magento is available in 3 different versions. These include the free to use Community Edition, the licensed Enterprise Edition and the hosted solution “Magento Go”. It takes a skilled team to design and develop Magento Ecommerce websites. We are constantly striving to increase our capabilities and offerings to clients, we have successfully integrated accounting packages (MYOB,Xero…), CRM (Sales force, Zoho…), ERP systems and custom modules with Magento in a seamless way. 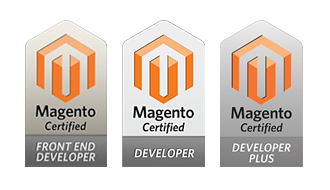 For over 6+ years we have delivered more than 50+ E-commerce Magento Applications for 40+ customers.